From the time the children started preschool, the teachers had been teaching the children to make cards or crafts for occasions like Mother's Day or Father's Day. When they reach home, they will present it to us. As they like to do handicraft, especially the girls, they will also do cards for our birthdays and anniversaries. Though they used normal printing paper to do the card, the cards are still nice in my eyes. Most importantly, the cards are unique as all are drawn by our children. On my birthday, I received cards from 3 kids and a red packet from Amilie as well. Haha! Can't remember how much she had given me but isn't that sweet? Papa recently bought MTG cards online. The card game which he played when he was younger. Papa taught the kids on playing the game. 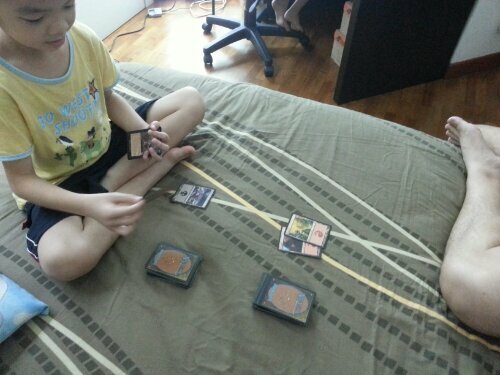 Everyday, Izaac asked Papa whether he can play the card game. Sometimes, Izaac managed to win a game or 2. Here's another game between papa and Izaac. Well, girls will be girls. I remember when Athina is still a baby, she dislikes people to touch her hair. Now, she doesn't mind at all. She will want her hair to be tied and she doesn't mind having her head bonded by hair band. When she knows that her picture is being taken. She will smile sweetly at the camera. She is able to pose different poses when I told her to. Here's a few of her sweet smiling poses. Athina is able to hold herself up with support of anything that she can hold on. See how she is using the Mega Blocks Box as a support to hold herself.